I have had the pleasure of owning both a MiniBrute and a Microbrute, though I have to say I ended up keeping the MicroBrute for my purposes. Although it is missing some features of its bigger brother, it is still an outstanding and mind blowing piece of equipment. The fact that it is a modular synth, has MIDI capability, can be used as a MIDI controller, has a mod and pitch wheel, and has 3 independent oscillators with a sub-oscillator that does overtones, all for around $260, is quite the deal, especially because you do get that 100% analog sound that is so desirable. Pros: -Compact, can fit in a backpack -MIDI controller as well as synth -Affordable 100% analog -Sub oscillator can do fifths (this isn't even on the MiniBrute!) -Mod via cables (not available on MiniBrute either) Cons: -Cannot determine how far the pitch wheel bends, only goes a whole tone -Sub oscillator is more for an overtone than it is a full note, but with some modding it can be made to sound fatter I 100% recommend this piece of equipment as a first analog synth. Despite the fact that this is monophonic, that means it can be great for leads OR bass patches. It even comes with patch sheets and the manual teaches you about analog synthesis. Arturia, you are God's gift to electronic musicians. This is incredible. back in the 80s, an analogue synthesizer featuring the sheer amount of "power" the MicroBrute holds would easily cost $1000 and be 2 to 3 times its size. One good aspect of the advances of modern technologies has enabled analogue synthesizers to be reproduced in smaller, more compact, and more affordable pricing. 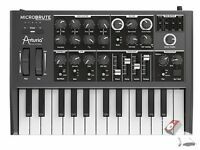 Many will claim the "MiniBrute" is a better investement for its full-sized keyboard, but for those who don't mind those old school "Sears"/"Radio Shack" toy synth key sizes, the MicroBrute will prove to be just as effective and enjoyable. I have had mine for almost a year now and am still discovering new things about it. There are some slight limitations. A monophonic keyboard (both in mono-timbral and external sound wiring) which needs about 10 minutes to "warm up" before being able to use the synthesis without the enveloppes "fazzing", with only a MIDI IN plug (note: any MIDI device should at the very least include a THRU along an IN). But the MicroBrute does have an internal 16-step sequencer reminicent of those good old D.A.F.-Nitzer Ebb-à;GRUMM... post-industrial aggro dust days, one of the functions which sold me to this keyboard. An excellent "warm" analogue synthesizer for those who have some basic knowledge and analogue synthesis. Great Synth!! Not a Toy!!! Very rich analog sound in a surprisingly small and simple-looking unit!!! Lot's on control to shape sounds and the sequencer make this a great tool for any arrangement. Don't overlook the free and easy to use software you can download from Arturia to get the most functionality from the sequencer. amazing. Even that does not describe it well enough. The Midi keyboard is great, and the software is unreal. over 5,800 sounds..just too much to list. If you were to get any one midi keyboard and software set, this is the one to have. The beat step is also a lot of fun. can be used in so many different ways, and hook up to most any product you can think of. lots of outs, and different kinds of outs. Just awesome products. This is such a powerful little synth. Easy to use and sounds from the most delicate to the most monstrous are easy to get out of this little brute. The patch bay is my favorite part of this synth. Such great options are owned up by it to link to other bits of gear and to reroute internals. I am amazed all this is available at this price and size.